Dr. Al Benskin, Principal at Waxahachie High School, brought his Students of the Month for December and January to be presented to the Rotary Club. Zenon Bernard is the WHS student of the month for December. She is the daughter of Patsy and Bennie Bernard. She is a senior at WHS where she has been involved in several of the school’s clubs including the American Sign Language Club and the Interact Club. For three years Zenon showed rabbits in the Waxahachie chapter of the FFA and made sale twice. She has also been a member of the Spirit of Waxahachie Indian Band for four years and has been involved in many of the band’s recent victories. She is proud to say that she was a member of the varsity band that won the bronze medal at the state marching competition. She has represented the Waxahachie band in all regional band competitions for four years and made the concert band the last two years in a row. Outside of school, Zenon stays active in her studies and volunteering. She volunteers at SPCA and for the Interact Club. She also volunteers as a peer tutor at the high school library. In the summer of 2016 Zenon represented Waxahachie by becoming a Texas Ambassador of Music on a tour throughout Europe. Also during that summer she was given the opportunity to attend the National Student Leadership Conference at Georgia Tech University. While there she learned many leadership techniques and forged her passion for physical therapy. Next fall year she wil be attending Texas A&M University and pursuing her dream of studying physical therapy. Annabeth Hayes is the January Student of the Month. She is the daughter of Penny and Greg Hayes. She is a senior at WHS in the top ten in her class and has received the Superintendent’s Honor Roll every year of her high school career. She is a member of the Spirit of Waxahachie Indian Band and has been a leader in the program for two years, serving as historian, social officer and flute section leader. She is also a three-year member of the Wind Ensemble, the 2018 TMEA 5A Honor Band Champion. Annabeth also was a member of the Spirit of Waxahachie Indian Marching Band, the 2017 Bronze Medalist and 2016 and 2017 Bands of America Finalist. She attended the 2016 Flute Festival at Texas Woman’s University where she was named one of the Honors Soloists. She has competed in the UIL Solo and Ensemble for three years and has received top rankings of "One" every year. Annabeth is a member of Interact participating in Mums for Emily and bell ringing for the Salvation Army. Last summer she volunteered at the Ellis County SPCA where she enjoyed helping exercise dogs and cats. After graduating, Annabeth plans to attend the University of Texas at Austin to study architecture. 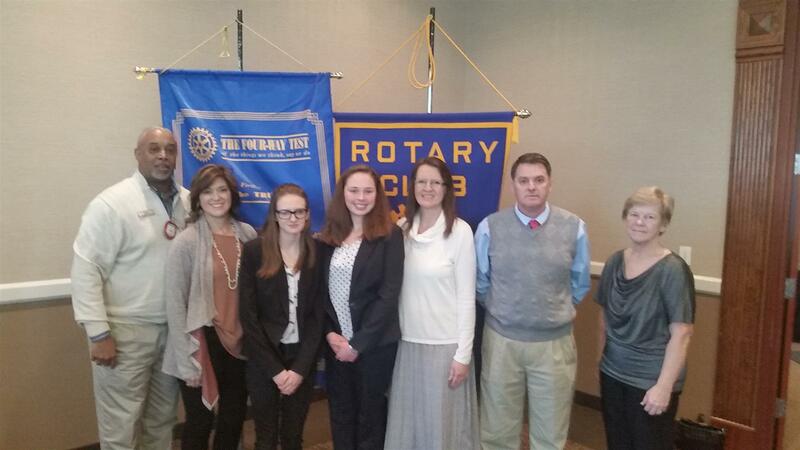 It is an honor for Rotary to acknowledge such outstanding students as Annabeth Hayes and Zenon Bernard. They have been presented with a plaque with their names engraved on it, which will hang in the hall of Waxahachie High. About the Waxahachie Rotary Club: The mission of Rotary International is to provide service to others, promote integrity, and advance world understanding, goodwill, and peace through its fellowship of business, professional, and community leaders. The Waxahachie Rotary Club meets each Thursday at 11:45am at the Waxahachie Civic Center.